A document listing clothes supplied to Leslie Payne from the C.A.S.C. (now in the possession of his daughter) is dated 23 October 1914, two and a half weeks prior to his enlistment. This suggests he was already a member of one of the two exisiting militia companies - probably No. 18 Company, under Lieut. J.R.C. Stanley - before he signed his Attestation Paper (View Front and Back) on 11 November. In answer to the question, "Do you now belong to an Active Militia?" he answered, Yes, so he must have been training with them for a few weeks. The clothing issued was the new khaki serge, in contrast to the "resplendent blues" issued to the Winnipeg militia companies before the war. No. 18 Company was at that time based in the St. James suburb of Winnipeg, an area containing a high percentage of men of British birth, who were far more likely to volunteer for service than those who had less contact with the "old country." Indeed, a later company historian wrote, "the martial spirit seemed to be more apparent in the men of St. James." Their headquarters, where they met for parades one evening a week, was at St. James Hall, Berry Street. 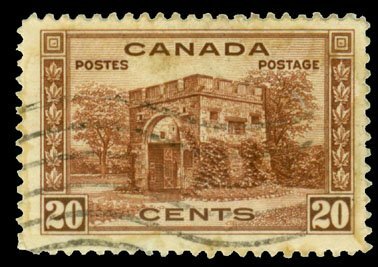 I remember Dad speaking of having been in the Fort Garry Horse before becoming a machine gunner … Fort Garry Gate features on the 20 cent [Canadian] definitive stamp issued 15 Jun 1938, and it's possible that sight of this prompted Dad to tell me. Many of the young bloods who were disappointed because they had not been included in the [first] overseas contingent, transferred to the Garrys and the artillery, which had not yet entrained, or to infantry units with larger allotments which seemed to offer a better opportunity of getting over before the war was over. The 34th F.G.H were a militia unit which became the 6th Battalion Canadian Infantry in the First Canadian Division … There was an organized mobilization plan in Canada, [but] once war was declared it was thrown out … by Sam Hughes, the then Minister of Militia. Militia units were diced and formed entirely new regiments. Traditions and years of service were buried to serve the new army. For the C.A.S.C. it was the same. So the 7th (Winnipeg) Company was formed from the two militia C.A.S.C. Companies and independent volunteers in Winnipeg in 1914 ... The cavalry in 1914 were seen as the elite force and every young man who could ride desired service in such a unit … as 90% of the CASC were horse-drawn at that time, [CLLP] would have been mounted. I suspect that [CLLP] served in the 34th F.G.H. pre-war. In August 1914 the Garrys were not mobilised as Cavalry, but were given the opportunity to populate the 6th Battalion, C.E.F. as infantry. This did not appeal to many horsemen, so he may have bided his time until November, when positions in the Service Corps opened up. This allowed him to get overseas, and still remain 'mounted'.